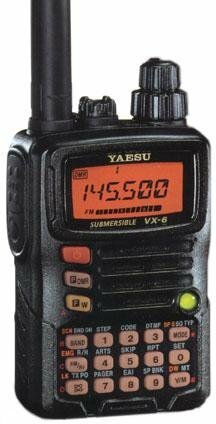 Yaesu VX-6R Triband Amateur Radio Transceiver. 144/222/440 xmit (2 meter, 1.25 meter & 70cm), plus 0.5-999Mhz receive range too (AM/FMN/FMW, less cellular). Built-in PL & DPL, Alphanumeric. Can receive AM/FM broadcast radio, Shortwave, CB, Police, Weather, Aircraft & marine bands. Includes Antenna, HiCap 1500Ma Batt & charger. Waterproof & submersible (rated 3ft for 30 mins). Has a security password feature, built-in morse code trainer, black magnesium case. For Optional Programming Software & USB cable search B004H5Q8IM . This unit is also compatible w/the following OPTIONAL Yaesu Speakermikes, chargers & accessories - CD-15A, VC-27, MH-73A4B, VC-24, SDD-13, E-DC-6, CT-91, ADMS-vx6, csc-91, FBA-23 (all sold seperate). Black magnesium case, 900 memories, severe weather alert and multicolor transmit/receive LED.